We teach private flute, clarinet, alto and trumpet lessons for all levels, and students may add a Star Power Band for the ultimate music making opportunity. In a private flute lesson, the teacher has the opportunity to help the student individually for the entire lesson time, and structures each lesson personally for the student depending on their skill level and goals. We teach all styles of music, from beginning basics through baroque, classical, popular and familiar songs– you name it! Young students begin with a recorder and learn all of the fingerings, breathing techniques, posture, and more concepts, learning a lot of basics before moving on to the flute (this lets the student focus on the most important aspects of playing without holding a heavy instrument). Students usually upgrade to a full size flute around the 3rd or 4th grade, or earlier with a curved mouthpiece, or if they are more physically developed at a younger age, it all depends on arm length (need to be able to reach the g# key with their pinkie finger without struggling to do so). Private flute students are welcome to perform at our Coffee House Shows, Music Showcase in June (optional), take the Texas State Theory Test in May (optional) and also participate in our Rising Star Music Competition in January (optional)and Achievement Auditions (optional). 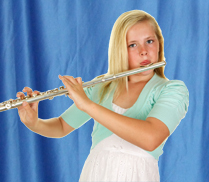 Private flute lessons are designed for students to progress at their own pace. Students/parents have input about the style and genre of music they would like to work on. Parent is welcome to observe the lessons, or learn to play right along with the student FREE. In a private clarinet lesson, the teacher has the opportunity to help the student individually for the entire lesson time, and structures each lesson personally for the student depending on their skill level and goals. We teach all styles of music, from beginning basics through baroque, classical, popular and familiar songs– you name it! Private clarinet students are welcome to perform at our Coffee House Shows, Music Showcase in June (optional), take the Texas State Theory Test in May (optional) and also participate in our Rising Star Music Competition in January (optional)and Achievement Auditions (optional). 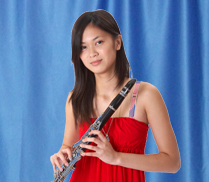 Private clarinet lessons are designed for students to progress at their own pace. Students/parents have input about the style and genre of music they would like to work on. Parent is welcome to observe the lessons, or learn to play right along with the student FREE. In a private alto sax lesson, the teacher has the opportunity to help the student individually for the entire lesson time, and structures each lesson personally for the student depending on their skill level and goals. We teach all styles of music, from beginning basics through baroque, classical, popular and familiar songs– you name it! 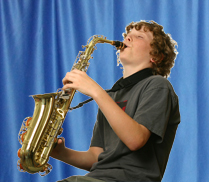 Private alto sax lessons are designed for students to progress at their own pace. Students/parents have input about the style and genre of music they would like to work on. Parent is welcome to observe the lessons, or learn to play right along with the student FREE. In a private trumpet lesson, the teacher has the opportunity to help the student individually for the entire lesson time, and structures each lesson personally for the student depending on their skill level and goals. We teach all styles of music, from beginning basics through classical, popular, jazz and familiar songs– you name it! Private trumpet students are welcome to perform at our Coffee House Shows, Music Showcase in June (optional), take the Texas State Theory Test in May (optional) and also participate in our Rising Star Music Competition in January (optional)and Achievement Auditions (optional). 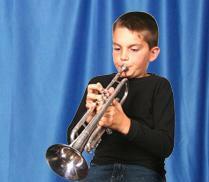 Private trumpet lessons are designed for students to progress at their own pace. Students/parents have input about the style and genre of music they would like to work on. Parent is welcome to observe the lessons, or learn to play right along with the student FREE. STAR POWER BAND SERIES EACH WEEK WITH YOUR BAND! The Star Power Band Series at the Frisco School of Music is our best value, and a very unique and popular series. Students have their regular private flute, clarinet, saxophone or trumpet lesson each week, plus attend a one-hour Star Power Band Class each week as well. Let us help you with this very important decision to make sure that you choose the right music school for flute or trumpet lessons for you and your family. Click here to enroll on-line, or contact us directly at 214.436.4058 and we will be happy to help you decide.